Heads up, State Route 167 travelers: If you drive on northbound SR 167 near the Interstate 405 interchange in Renton, be prepared for a big change in how you travel along that stretch of roadway. As early as Wednesday night, Jan. 31, our contractor crews plan to complete striping work to move the northbound SR 167 lanes of traffic farther to the right on the roadway. Rest assured, we won't be taking away any lanes as a result of this shift, just moving their location. This work depends on having dry conditions, so our crews will need to postpone their work to the next dry night if weather does not cooperate. We recently widened the road on SR 167 to make room for the future flyover ramp for the I-405/SR 167 Interchange Direct Connector Project. Once crews finish this next weather-dependent work, drivers will use that newly paved area. 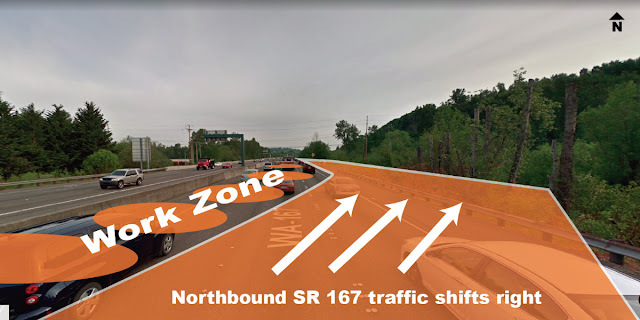 Workers will be able to continue construction for the project in barrier-protected work zones in the center of the roadway, between the northbound and southbound lanes of SR 167. We realize that major traffic changes can be an adjustment, especially during your daily commute. Reconfiguring traffic is important for crews to keep our construction projects on schedule. We completed a similar shift last May on southbound I-405, and just look at how much progress we have made on the project since then! What upcoming closures should I be aware of? 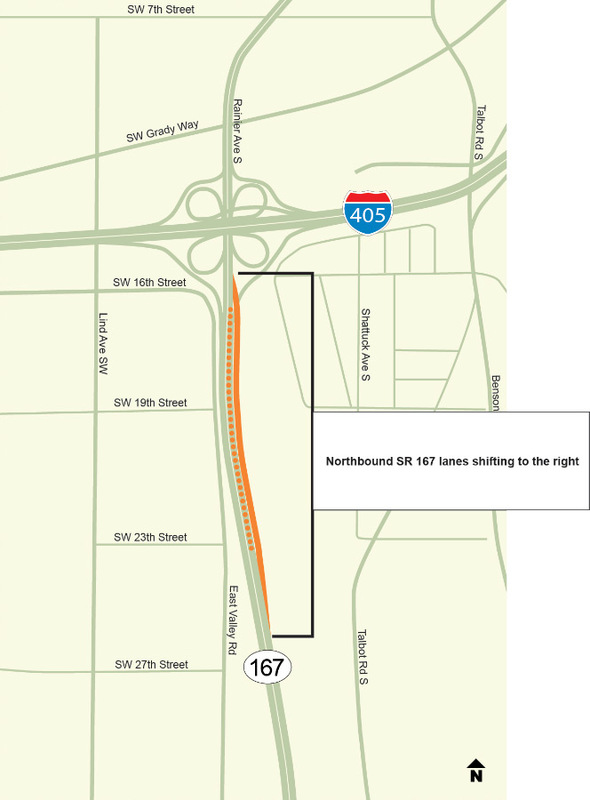 Up to two lanes on northbound SR 167 between South 180th Street and I-405 will be closed from 10 p.m. to 7 a.m. The northbound I-405 ramp to northbound SR 167 will be closed from 11 p.m. to 6 a.m. A signed detour will be in place. The northbound SR 167 ramp to northbound I-405 will be closed from 11 p.m. to 6 a.m. A signed detour will be in place. 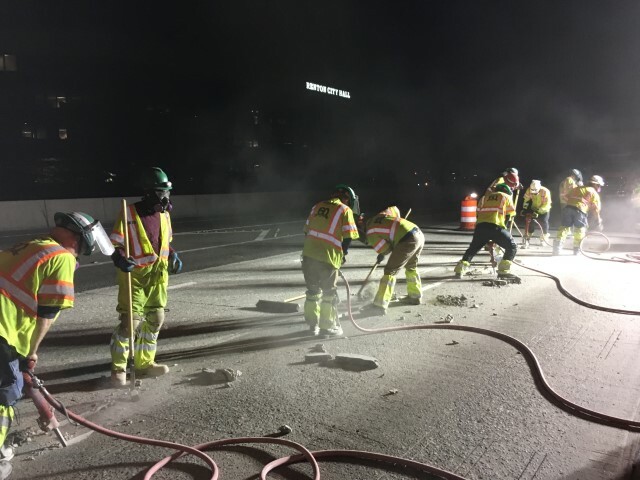 In case we need to postpone this work to another dry night, be sure to check our I-405 Construction Updates page and our King County Construction Updates page for all of the latest closure information. The wheels on the bus (or cars, trucks, and motorcycles) go 'round and 'round. That's both a great kids song and how a roundabout at a busy intersection is supposed to work. Yes, when the vehicles already in the roundabout are going 'round and 'round, the drivers who are about to enter the circle need to wait until it's clear to enter. We'll say it again: You must yield to vehicles already inside the circle. Wait for a gap, then you can enter. Drivers already inside the roundabout circle should never have to stop for an entering vehicle. Drivers using our first multi-lane roundabout on US 2 near Fairchild Air Force Base just west of Spokane are still getting used to the new intersection. Often the issue is drivers ignoring the yield signs and cruising into the circle, forcing drivers already in the roundabout to stop. This creates a chain reaction that creates problems. Just as important as those outside the roundabout, it's important for those in the roundabout to remember that when you see vehicles approaching from the right, you don't have to stop for them. They're supposed to stop for you. Stopping within the roundabout also impacts the flow. When both those inside and outside the roundabout understand and follow those rules, traffic maintains an even, safe flow. Built to provide access to the new Spokane Tribe Casino, drivers started using the US 2 roundabout in early November 2017. At that point, there was no side-street traffic to yield to and people became used to that. But when the casino opened on January 8, vehicles are now entering from the casino drive and those not accustomed to the extra traffic are getting confused. So now is a great time to refresh yourself on the roundabout rules. When everyone in that area understands and follows the roundabout rules, everyone continues to move safely through. Hopefully you’ve never personally learned the value of our highway barriers. But if you have found yourself in a collision and hit a barrier, you know it can often be the difference in minimizing a crash by keeping a vehicle out of oncoming traffic or careening off the road into danger. Whether concrete, metal or cable, highway barriers increase safety on the roadways and are an important part of our infrastructure. Because of that, starting in February we’ll be upgrading cable barrier in 12 locations along six different highways, bringing safety improvements to almost 40 miles of roadway. 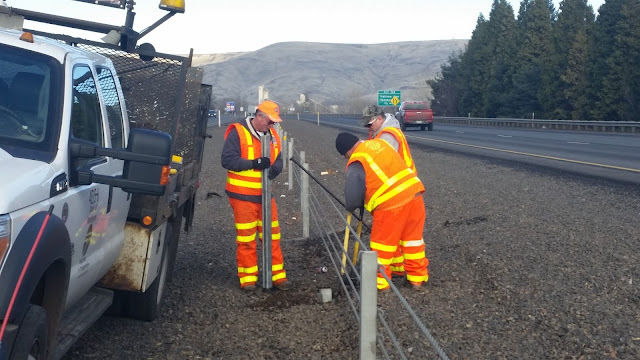 Our maintenance crews repair a cable barrier post along I-82 in Yakima County just north of SR 24.
will have median cable barrier upgraded to 4-strand, like this. We’re not just replacing old cable barrier with more of the same, though. Instead, contractors from Petersen Brothers will change the current 3-rope cable barriers to a 4-rope system. This gives the new barriers a lower bottom cable and a higher top cable, decreasing the potential of a vehicle going under or over the barrier. We’ll also be adding posts, fittings and hardware and removing worn-out pieces. This project, encompassing I-5 in northern Snohomish, Skagit and Whatcom counties, SR 18 in the Kent and Renton areas, SR 20 near Burlington, SR 99 in Tukwila/Seattle, SR 522 in Woodinville and SR 539 near Lynden, will happen between February and June. While work will take place in the medians, there will be the need for some lane closures. In 2018 we will upgrade sections of cable barrier in four counties, including this stretch of SR 20 in Skagit County. The upgrades will add a fourth cable and lower the bottom cable to help reduce drivers from crossing through the median into oncoming traffic. 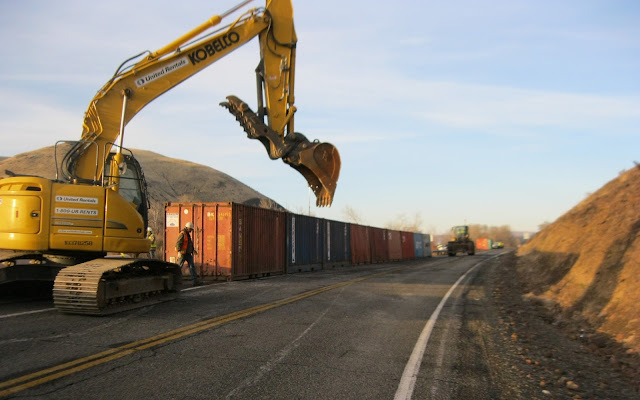 The improvements will stretch from Blaine all the way to Kent, with crews completing one spot and moving on to the next, starting on SR 18 from Kent to Covington. But where exactly? Peace Portal Drive exit to near D Street in Blaine. Main Street interchange to the SR 548/Grandview exit in Ferndale. Near the SR 542/Sunset Drive exit to near West Bakerview Road in Bellingham. Happy Valley near Fairhaven Parkway to the South Samish Way overpass in Bellingham. Just before SR 11 to near the State Patrol office in Bow/Burlington. 300th St. NW to near Anderson Road in Stanwood/Mount Vernon. East of SE 304th St. in Kent to near SR 516 in Covington. West of SE 188th St. near Renton to Issaquah-Hobart Road SE. SR 536/Memorial Highway to near Pulver Road near Burlington. North of Tukwila International Blvd. to just south of S. Holden St. in Seattle. West of I-405 in Bothell to near NE 195th St. in Woodinville. Just north of Ten Mile Road on Guide Meridian to near the Nooksack River south of Lynden. This project will upgrade all stretches of median 3-rope barrier currently installed in these four counties. 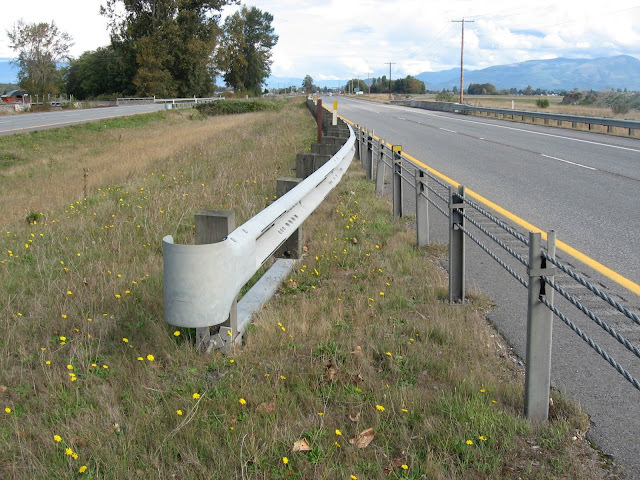 When selecting locations for median guardrail we look at a variety of things, including crash history, traffic speed, geography of the road, objects like overpass foundations, signposts and trees, as well as the cost of installation and maintenance. Specifics about work hours and dates are still being finalized but will be available on our website. Please be sure to be safe and focused around work zones, for your safety as well as the workers. While the cable barriers are designed to keep you safe, we would prefer that you never have to use them. If you drive on Interstate 405 near the State Route 167 interchange in Renton, then you have probably noticed a lot of activity throughout the past year. Since breaking ground in September 2016, we’ve been hard at work, making progress and reaching many milestones for the I-405/SR 167 Interchange Direct Connector Project. The Direct Connector will be a flyover ramp connecting the HOT lanes on SR 167 with the carpool lanes on I-405, which will reduce weaving and improve traffic flow at this heavily congested area. Our contractor is scheduled to complete the project by mid-2019, but as of Jan. 1, the project is already halfway complete in terms of the milestones it has met. Let’s dig a little deeper into what exactly our crews have finished so far and what they have left to complete. Back in May, our crews shifted traffic on southbound I-405 to the inside of the freeway and reconfigured the Rainier Avenue South and SR 167 exits. This was necessary to create safe work zones for construction crews to begin building the future flyover ramp. There are still two other traffic shifts left for crews to implement so they can safely finish work for the project. We have tentatively scheduled the second major traffic shift, which will push lanes of SR 167 and I-405 toward the outside of the highway, for this January and February. In the spring and summer of 2017, crews finished relocating an existing noise wall about 100 feet south on a large hillside in the Talbot Hill neighborhood. In early July, they began hauling 80,000 cubic yards of dirt to make room for the future flyover ramp, which is enough dirt to fill almost 70 Boeing 747 airplanes! Crews moved the dirt from the Talbot hillside to the loops at the I-405/SR 167 interchange on and off-ramps. During this time, they also planted trees and shrubs on the hillside across from Renton City Hall, but they still have to complete the landscaping work on the Talbot hillside. As part of our policy, we must follow rules about replanting trees after removing them for construction projects. Now that they have moved the dirt from the Talbot hillside, they can plant trees and shrubs in that location too. In the late summer through early fall of 2017, crews began working on other parts of the project that were not as dependent on good summer weather but just as important. We have been required to improve creeks and streams in the region by rebuilding fish barriers in addition to restoring and relocating the creeks and streams so the fish in those waterways can swim more freely. We call this work “fish passage,” and we typically divide the construction into three stages for our projects. 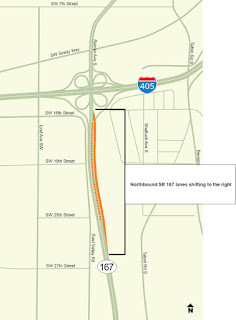 For the Direct Connector Project, the first stage began in mid-September next to the northbound side of SR 167. Crews will be replacing a fish barrier with a passable culvert to help fish swim more easily through Rolling Hills Creek. 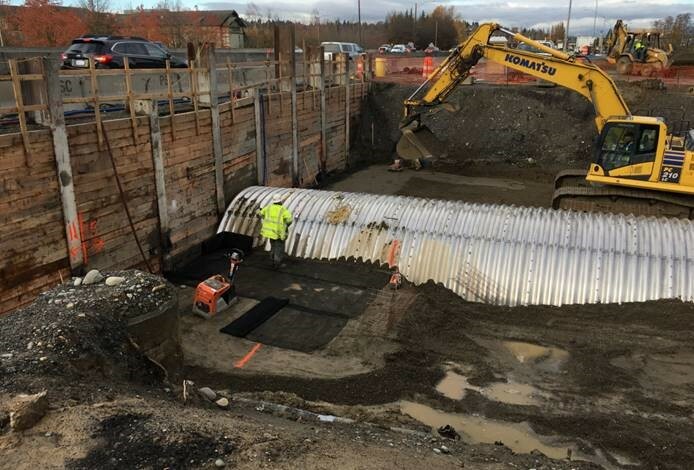 A culvert is replacing a fish barrier to help fish swim more easily through Rolling Hills Creek as part of our Direct Connector project. We’ve completed the first stage of fish passage work, but still need to complete the second and third stages, which is when we will relocate and restore the stream for the fish culvert. This work will wrap up in August with a weekend closure of one direction of SR 167 in the area near the culvert construction. This past June, crews began strengthening the pavement on both northbound and southbound I-405 in the project area. They did this by installing dowel bars, which are short bars made of steel, in between the concrete panels of the freeway. These dowel bars help transfer vehicle weight evenly between the concrete panels. In August, workers began grading, which means they flattened the ground to make it smooth and level before they could repave the roadway. Then they took advantage of the continued dry weather by starting and completing a significant stretch of paving in six weeks. They repaved 10.2 lane miles of southbound SR 167, which is equal to the length of about 89 Space Needles! When crews repaved the freeway in this area, they also widened it to make room for where the flyover ramp will begin or end on SR 167, just south of the I-405 interchange. In 2017, crews repaved and widened more than 10 miles of southbound SR 167, and strengthened the pavement by adding dowel bars which transfer vehicle weight evenly. We have made huge progress on building new bridges alongside both directions of I-405 at the Talbot Road South exit. We’ve completed the substructures for the bridge on both directions of the freeway and have placed the girders, which are the main horizontal support of bridges. All that’s left to do is pour concrete for the bridge deck on the southbound side of I-405. The direct connector flyover ramp will consist of 20 columns, which make up 10 piers. The flyover ramp will also have two abutments, which support the ends of a bridge or ramp. As of Jan. 1, crews have drilled 13 shafts and formed 11 columns, making up 5½ piers of the flyover ramp. They have even begun installing platforms on top of some of these columns in which crews have already placed concrete to form two crossbeams. 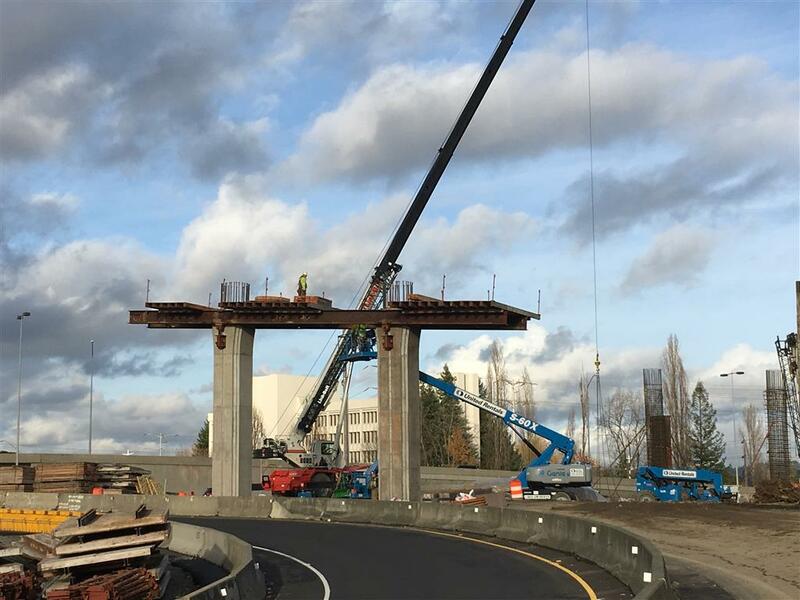 Platforms to hold the new SR 167/I-405 Direct Connector flyover ramp have started to be constructed. Once they implement the next traffic shift, crews will continue to drill seven more shafts to build the foundations for more columns. They will also construct the abutments for the bridge, pour concrete for the rest of the columns, place crossbeams and pour the bridge deck. While we have reached plenty of milestones in just a year, we still have many left to reach before we open the Direct Connector to traffic. We realize construction can be an inconvenience for nearby residents and motorists, but we hope you can share in the excitement of the major milestones we have reached for this project. Once our contract crews have finished building the ramp, it will help vehicles move more smoothly at this critical interchange. In the meantime, check out our photos showing the construction progress on the project, stay tuned for more information about the upcoming traffic shift in February and the weekend road closure scheduled for next summer. Social media sites like Twitter have become a popular place to get real-time traffic information. We’ve had great success connecting with the public across our 12 traffic Twitter accounts and every day more and more people are turning to our accounts to help #KnowBeforeYouGo. Wait, 12 accounts? That sounds a little overwhelming. But remember, this is a big state and traffic patterns differ greatly from place to place. We felt by localizing accounts for particular parts of the state would help people find the information they’re looking for in as easy a way as possible. Each account represents a different area of the state or state highway system and is run by our Public Information Officers (PIOs). Combined, we have more than 875,000 followers on Twitter, and our @WSDOT_Traffic and @WSDOT accounts are the two most-followed DOT accounts in the country. People who follow us recognize that they can turn to us for updated, accurate traffic info and can get their questions answered quickly. Not a Twitter user? That’s OK! If you download our mobile app, we have a section that compiles all of our Tweets so you can follow along without actually being on Twitter. So which of our Twitter accounts should you follow? It all depends on where you live and what information you’re looking for. The flagship of our Twitter arsenal. This account provides important messages and helpful tips for commuters statewide. Unlike our other accounts, @wsdot usually stays away from tweeting about traffic-related incidents unless there is something happening on our highways that will have a major impact on commuters – for example, if a mountain pass were to close. Instead, this account helps point people in the right direction if they have a specific question another account may have more details about, as well as providing agency- and state-wide information. The most popular DOT account in the country with more than 452,000 followers, it covers the traffic happenings of King and Snohomish counties. This account keeps an eye on the traffic in Skagit, Whatcom and Island counties. Don’t let the name “Tacoma” in the handle fool you. This account covers our Olympic Region, which includes the South Sound, including Tacoma and Olympia as well as JBLM, all the way to the Olympic and Kitsap peninsulas. This account covers our Southwest Region – blanketing Lewis, Pacific, Wahkiakum, Cowlitz, Skamania, Klickitat and Clark Counties, including the Vancouver area. account for traffic information from the Vancouver area. Our East Region stretches from the Cascades all the way to the Washington-Idaho border, meaning @wsdot_east has a lot of roads to watch over. To make sure everything is covered effectively, the region is broken up into three sub-regions: North Central, South Central, and Eastern. But all tweet under this handle. for information like the slow-moving landslide near Yakima. With I-90 Snoqualmie Pass being our state’s most heavily trafficked east-west highway, this is the best way for travelers to stay up-to-date with road conditions, travel delays and possible closures on that route. This account’s sole job is to inform commuters of the road conditions on all of our mountain passes – from Blewett to Stevens to White. Automated tweets go out every few hours or so to make sure you stay on top of how things are looking on those major highways. Since it is an automated account, it won’t reply to any of your questions. Instead, send your inquiries to either @wsdot, @wsdot_east, or @SnoqualmiePass, depending on which pass you want to know about. This is the account you’ll want to follow for updates on the SR 520 Bridge Replacement and HOV Program. The project is currently in its final phase of construction, called the West Approach Bridge North. Sometimes this project will require either directional or full closures of the floating bridge. Any time one of those is going on, you’ll see it on this account first. Stay on top of what’s going on with our state’s tolling system on the I-405 Express Toll Lanes, the SR 520 Floating Bridge, the Tacoma Narrows Bridge, and the SR 167 Hot Lanes. Whether you’re a frequent ferry commuter or the occasional waterway traveler, this account is for you. The ferry folks provide travel information as well as special ferry-related news and announcements. Interested in seeing how the new SR 99 tunnel is coming along? This account provides updates and really cool videos on how the project is doing. Now that you know about our different Twitter accounts, what are you waiting for? Go out and follow them!